Stowaway cat survives 3 weeks in shipping container from China to B.C. 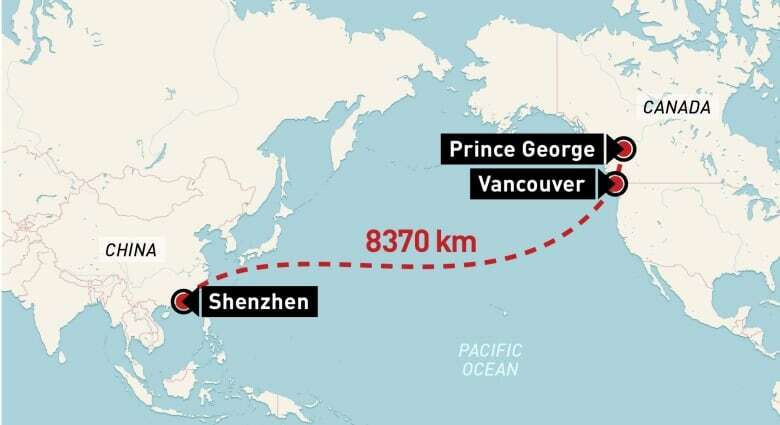 An orange tabby cat is likely to have used up more than a few of its nine lives during an unauthorized trip from China to British Columbia. The North Cariboo District Branch of the B.C. SPCA says the emaciated, six-year-old female was found inside a shipping container loaded nearly a month ago in Shenzhen. The container arrived by freighter in the Port of Vancouver and was shipped to Prince George, where the unnamed cat was found among the pallets, shredded cardboard and foam pellets inside the container. The animal had no food or water but it’s believed it survived by licking condensation that had formed on the walls of the shipping container. Animal control officers say the feline weighed just 1½ kilograms when it was found by staff at a Prince George auto glass distribution company as they unpacked the crates. Alex Schare with North Cariboo District SPCA says she knew right away that the cat would have an amazing story, but would also require life-saving care following weeks of starvation. “We rushed her to the vet because she was in such poor condition that we knew she would require intensive veterinary care for an extended period of time to regain her strength,” Schare says in a news release. The cat is on fluids and is receiving small amounts of food to ensure its body adjusts properly to renewed nutrition. “She has also undergone blood work and will receive a rabies vaccine and dental work when she is strong enough,” the release says.